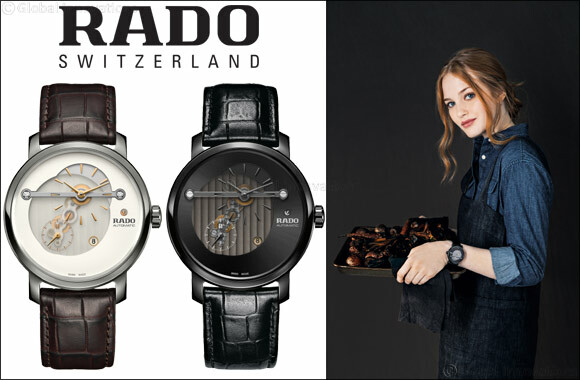 Dubai, UAE, April 9, 2018: The new Rado DiaMaster models showcase Rado's bold approach to design and how the brand succeeds in daring to be different. The unique multi-level dial displays the elements of time – hours, minutes, seconds and date – in decentralised, intersecting circles. Each is connected to the other, but also exists independently. On the dial, the separate elements come together to form a harmonious whole. With pared-down details, and large, open and readable dials, the DiaMaster has proudly represented Rado's minimal side – until now. With traditional C�tes de Gen�ve detailing on the movement visible through the transparent dial and the exposed gear trains from the movement also on display, there is a lot to take in at first glance but just as much to hold your interest in the years to come. Making the most of the unusual arrangement of the movement with small second at seven o'clock and the hours and minutes dominating the upper half of the dial, the Rado designers have also brought in an additional design element in the form of a bar reminiscent of a horizon, bridging the transparent divide of the dial from left to right. With two models, each housed in a 43 mm monobloc high-tech ceramic case, presented in scratch-resistant, light high-tech ceramic, the new DiaMaster has a case and dial combination to suit every taste. The all black model is a piece of polished perfection, and the plasma and white is punctuated by two diamonds on either side of the bar for an additional dash of luxury. The collection has all the essential elements you would expect from the master of materials, with all the daring you look forward to from Rado as a multi-award winning designer. With the 2018 DiaMaster collection, Rado is definitely raising the bar.